CH Family Men, was released for the first time in 2009 and today, three years later, we introduced the new member that concentrates the smell of sand, sea and wet wood of classic motor boats. We’re talking about CH Men Sport, a young fragrance and sportsmanship that comes inspired by a unique personality. Of a man and a gentleman, who uses his intellect and follow your heart. He fixed on the woman’s body, but his soul that fascinates him. The perfume is advertised as fresh, aromatic and green, with refreshing aquatic notes in the heart and a sensual woody base. CH Men Sport is characterized by the union of opposites. With a spicy oriental composition that is contrasted with citrus and flowers. The man who chooses this fragrance has a distinct personality. He is smart and careful in all aspects of life. He lives life to the fullest and enjoying every moment. He sees the sport as part of your lifestyle, it is very masculine and has a youthful spirit. 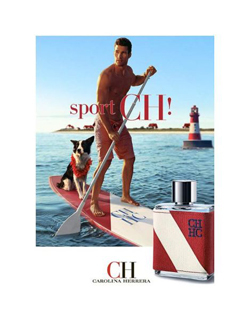 The new scent for men Sport CH Men contains fresh and bright drops of bergamot and grapefruit combined with sage. A heart that is updated with the notes of the sea mixed with aromatic spices and agreements of Sichuan pepper and juniper berries. Its base is sensual and gentle, created of sandalwood, oak moss and vetiver.